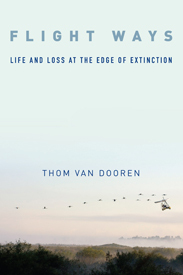 The fantastic team at Columbia University Press have designed a cover that uses a section of a beautiful art work by Isabella Kirkland called “Gone,” part of her Taxa series. Painted in 2004, as Isabella describes it, “The sixty-three species depicted in Gone have all become extinct since the 1700s and the colonization of the New World.” You can see the image in full and get a key for the species represented here. You’ve really got to visit the site and zoom in to get a sense of the incredible detail of the piece.